Most airlines nowadays charge anywhere from $25-$50 to check a bag. Another expense on top of your flight, hotels, and meals is the last thing you want when traveling. The best way to avoid this fee? Take a carry-on suitcase instead. You might be thinking, “there’s no way I’ll be able to fit everything I need for my trip in a tiny carry-on!”. Luckily, most airlines allow a pretty substantial sized bag on the plane and if there are people who can travel for a year with just a carry-on, you can certainly make it work for any trip length. In this article, we’ll be reviewing the best carry-on luggage to buy in 2018 in the hopes that you’ll find the perfect fit for your travel needs. If you’re not sure what to look for in a carry-on suitcase, you’ve come to the right place. We’ll be covering a range of options that suit many different preferences and travel styles. Whether you prefer extra space in your bag, something simple and easy to use, a designer look, or one that comes with special features, you’ll be sure to find it here. Here are the top 10 best carry-on suitcases as of 2018. The Delsey Chatelet Hard+ Carry-On was made for the luxury traveler. It’s attractive design comes in two beautiful colors and is sure to stand out on the luggage carousel, if ever checked. The TSA-approved lock ensures the security of your items when your suitcase is out of sight and the spinner wheels will make rolling through the airport simple and stress-free. The Caribbean Joe Carry-On was made for the overpacker. With a large interior and the option to expand, you’ll have plenty of room for all your clothes and extra space for souvenirs. Even when completely full, this bag is easy to roll throughout the airport and lift into overhead bins. The Travelpro Maxlite3 Carry-On was made for the uncomfortable traveler. If the thought of traveling makes you sweat because you hate running through airports, standing in line at security, and sitting in tiny airplane seats, this suitcase is for you. It takes some of the stress out of traveling by making you a little more comfortable during the journey. The ergonomic, contoured handle grip and multiple positions make it easy on your arm for comfort while standing in lines. The 360 degree spinner wheels allow for easy maneuverability when running through the airport and its lightweight feel will make getting on the plane a painless process. The Briggs & Riley Baseline Carry-On was made for the business traveler. It was made with wrinkle-free packing in mind from its mesh garment panels, to its suiter with hanger, to its exterior handle that allows for flat packing. With this suitcase you’re guaranteed to arrive in your destination without having to use the hotel iron. The suitcase itself also caters to business travelers with its multiple exterior pockets. You’ll find two in the front for a laptop and travel documents and one in back between the handle for your mobile phone and earbuds. The Rockland 20 Inch Carry-On was made for the young traveler. The bright, colorful patterns are perfect for young children and even for older women. The suitcase itself is small and the perfect size for a child to fit all their items. It’s light and easy for children to roll with its multi-directional spinner wheels. If your child is ready for their first suitcase, this is the best choice. The fact that it’s very affordable is just the cherry on top! The Travelpro Maxlite 4 Carry-On was made for the frequent traveler. The stain resistant fabric will allow this suitcase to last many flights without looking worn out and dirty. The limited lifetime warranty guarantees that if your luggage is damaged by the airline, you’ll still be covered. Great for the person who takes multiple long-haul flights every year. The Goplus Globalway 20” Carry-On was made for the minimalist traveler. It’s a simple bag with no special bells and whistles, but it is a durable carry-on that will fit everything you need in its organized interior. 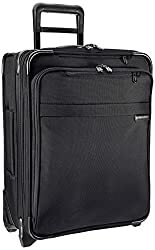 If you’re looking for a cheap, dependable suitcase that will get you from A to B then this is the right choice for you. The Rockland 20 Inch Carry-On was made for the flashy traveler. It comes in many bright, fun patterns which is sure to be noticed by everyone in the airport. Also makes it easy to identify on the luggage carousel, if ever checked. 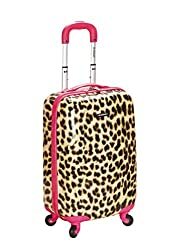 This bag is very affordable so you get what you pay for, but if animal print and bold patterns are your style then this suitcase is for you. The Goplus 20” ABS Carry-On was made for the simple traveler. You don’t need any special features or bells and whistles, just a sturdy suitcase that can get bumped around and keep your belongings safe. 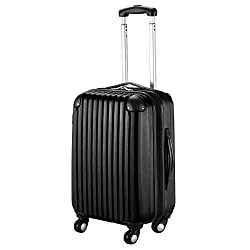 This suitcase is very easy on the wallet and holds up very well when checked. If you’re looking for a cheap and simple carry-on, look no further. 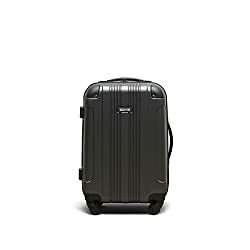 The Kenneth Cole 20” Carry-On was made for the long-term traveler. This suitcase is overall a great bag that is reliable, easy to use, and affordable. If you’re someone who takes long trips and needs to fit a lot of items in one bag, this carry-on is the best choice. It may look small but the interior is actually quite roomy. You can easily fit a month’s worth of clothing in while maintaining its lightweightedness and maneuverability. It is shock-resistant and tear-resistant, overall making for a reliable and sturdy suitcase. Now that we’ve covered a range of carry-on suitcases, which one speaks to you? Are you someone that tends to overpack or likes to leave a little extra room in your bag for souvenirs? Do you like the stylish designs that will stand out on a carousel or do you prefer something that can get banged up over hundreds of flights and keeps your belongings intact? Here’s a summary to help you decide. Suitcases tend to be made either with soft fabric or a hard shell. 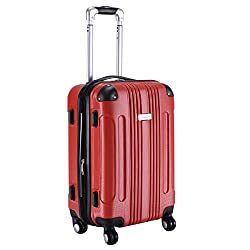 Soft fabric suitcases can get dirty and stained when going through security or if it’s checked onto the flight and hard case suitcases can easily get scratched, scuffed, or dented. You want your suitcase to last for years to come and you want it to continue looking new even after many years of flights. So when determining which suitcase to buy you should look for soft cases that are stain resistant and hard cases that are scratch resistant. Most of the carry-on suitcases we discussed in this article claim to be stain or scratch resistant, which is one of the reasons they made it to the top ten list. If a suitcase you’re considering purchasing doesn’t mention anything about stain or scratch resistant materials, be prepared to have a worn out looking suitcase after one or two flights. When it comes to picking a carry-on suitcase, size definitely matters. 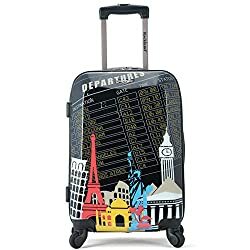 If you’re planning for this to be your main suitcase whenever you travel, you need it to be big enough to hold all of your belongings. A smaller carry-on is great for short trips or as an additional bag to your checked suitcase. 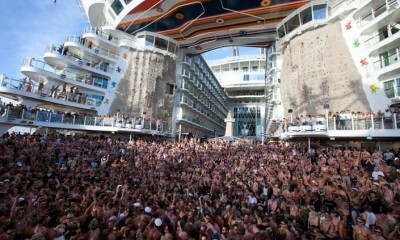 So you’ll need to determine the type of traveling you’ll be doing and how much you normally like to pack for a trip. You also need to ensure that the carry-on will adhere to various airline size limitations. The suitcases mentioned in this list should all work just fine for American domestic airlines, but the larger ones probably will need to be checked when in Europe or Asia. Navigating an airport is a stressful and chaotic thing that most people don’t enjoy. Make your life a little easier and get a bag with 360 degree spinner wheels. It is so much easier to roll than a bag with only two wheels and takes all the weight off of your arm. Every single bag on this list comes with spinner wheels so you are safe to choose from any of them. Many bags nowadays are also made with special handle mechanisms that allow you to set them at the height you would like. If you are a bit taller than average you’ll appreciate being able to fully extend the handle to suit your height so you’re not forced to bend over. And those who are shorter will love having the handle at a lower position so their arm can more comfortably relax at the appropriate height. 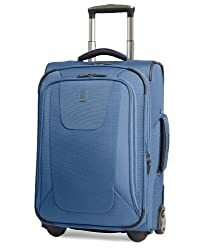 Make traveling a little easier and opt for the spinner wheels and handle locking systems. Which is better, a hard or soft suitcase? Soft suitcases are more lightweight and easier to fit into overhead compartments as they are more flexible. Hard cases are better for keeping your belongings safe from getting crushed as well as water leakage. Both are great options, but it depends on your preference – do you prefer to pack your suitcase to bulging or do you want more protection for your belongings? What’s the standard airline size limit for carry-on suitcases? Every airline has its own guidelines but the average for American planes is 22 inches tall x 14 inches wide x 9 inches deep. This will differ for international airlines. Are smart suitcases allowed on airplanes? As of 2018, smart suitcases have been banned from airplanes. Some smart suitcases are allowed as long as they have a removable battery, but we advise that you get a regular, non-smart suitcase for the time being. Will my suitcase come with a warranty? Most suitcases come with some sort of warranty, whether it’s for a few years or a lifetime. Check on the manufacturer’s website for more information regarding their warranty policy.